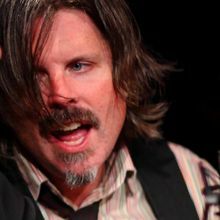 Son of a Honky Tonk singer from Stamford, Connecticut (unlikely, but true), Ry Cavanaugh has been a central figure in the Cambridge Folk and Rock (roots, if you like) scene for the last 14 years. He produced a live compilation, "One Night in Cambridge," in 1995 featuring Mary Gauthier, Faith Soloway, and many others. He was a founding member of cult-residency bands Vinal Avenue String Band (with Sean Staples and Kris Delmhorst) and Maybe Baby (with Jennifer Kimball). Also, a reluctant and brief member of the acclaimed Wayfaring Strangers. Currently performs with Session Americana and on his own. His song "Lighthouse Light" has been recorded by Mary Black and Redbird (Kris Delmhorst, Peter Mulvey, Jeff Foucault).